Notice I did not say books I bought. That is because I didn't buy most of them. I found them on free racks at the library and thrift stores. A lot of people seem to be giving away books lately. I'm not going to complain. So here we go, this is what I have acquired in the last few weeks. First up is All My Patients Are Under The Bed by Dr. Louis J. Camuti. It is the memoirs of a cat doctor. I seriously doubt it can compete with the James Herriot books which I have loved since childhood but you never know. It was free, I'll give it a try. My daughter also wants to read it. She loves all books about animals. Hmmm, maybe I should introduce her to James Herriot. Next, we have Doctor's Wife by Maysie Grieg. It is another book I got for free at a thrift store. I know nothing about it, it just looked old and therefore possibly interesting. I just looked it up. It looks like a doctor/wife/nurse love triangle thing. I think the wife conveniently dies at the end. Not my usual cup of tea but it might be amusing in a train wreck sort of way. This next book I actually bought. It is Jane Austen A Life by Claire Tomalin. I love Jane Austen and have read a lot of books about her and her writings. I have meant to read this for a while and finally got around to ordering it. It came in the mail today and brightened my whole day. Death Beside the Sea by Marian Babson is another free book from the thrift store. I think I read mysteries by her years and years ago. It looks imminently forgettable but sometimes I just need a mindless mystery to pass the time. The same thrift shop gave me Down and Out in Paris and London by George Orwell. I have heard of this but never read it. I thought it was autobiographical but the back of the book says it is a novel. Either way, it is about exactly what the title says, the adventures of a penniless writer living in the two cities. Again, I found this next book for free. It is Brooklyn by Colm Toibin. I have never read anything by him but I know a movie was made of this novel. I thought it was worth a try. The last two books I got at a thrift store but I actually purchased them. I am getting so used to finding books for free that that fact is a bit of a shock. They are The Game of Kings and Queen's Play by Dorothy Dunnett. Again, they are books I have heard quite a bit about but have never read. People seem to be a bit obsessed with this series and I think anything that inspires that degree of devotion is worth reading. I have high expectations for these which is not something I can say for all the other books on this list. I haven't included on this list the huge stack of books that the library was giving away that I got for my daughter. I can't remember all of the books, I got a bit over-excited and just kept pulling them off the shelf and shoving them into her arms. I do know one was The Wolves of Willoughby Chase by Joan Aiken. I liked that book when I was her age and I might need to reread it just for nostalgic reasons. And finally, one other thing I bought from a thrift store is this purse. I have a bit of an obsession with what my kids call "old lady purses." I don't care, I love them and add to my collection whenever I can. They aren't practical for everyday use, mainly because they are too small to cart around all my junk, but I use them when I am dressed up, much to the kid's slight horror. The purses make me feel like I should be wearing a hat, pumps, and a 1940s suit. If only I was. 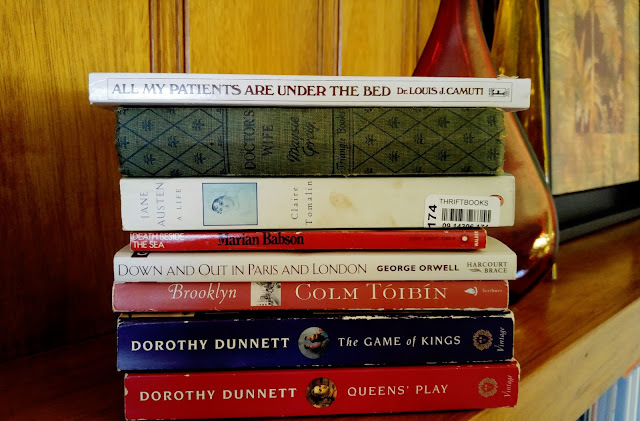 I am firmly in the "obsessed with Dorothy Dunnett" group, particularly with the Lymond Chronicles. I hope you enjoy these! I'll be curious to hear more about the cat doctor book. I am looking forward to reading them. So many people recommend them that I feel I must really be missing out! I would love to find another author that inspires that kind of obsession in me. There is nothing like reading a book that you know is going to be a firm favorite. I read the Jane Austen biography a few years back and loved it, which is saying something as I don't usually get on with auto/biographies. Enjoy! It is good to know that you enjoyed it. I am looking forward to reading it. I also ordered a volume of Jane Austen's letters which should make entertaining reading. I own a copy of Game of Kings, but haven't read it yet. Good haul! I think I am acquiring more books than I can read right now, especially when you add in library books. However, this is one book I am quite excited to read, I hear so many good things about it. Why, I love old lady purses as well. I think they are elegant and impeccable. I don't like slouchy hobo handbags. I found a beautiful taupy green, very structured old lady purse at a secondhand shop once. One of my favorite handbags! Sadly, like you said, they are impractical -- I can only fit the smallest, thinnest paperback inside such purses. And I need to bring at least one reading material wherever I go! Books are my security blanket. 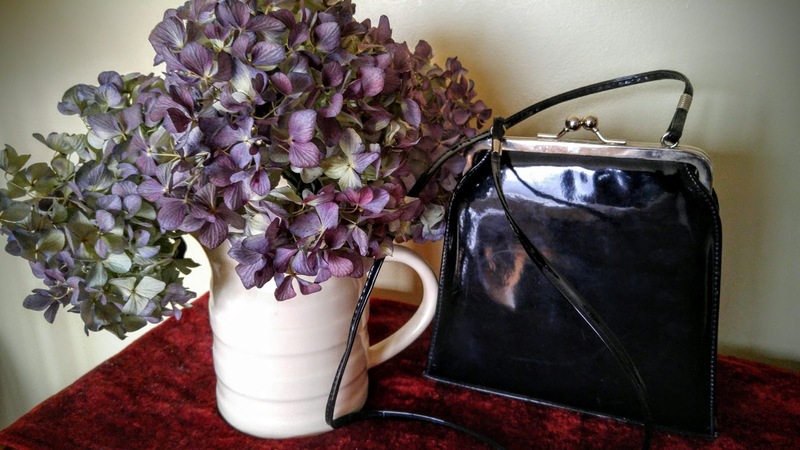 I am glad to know I am not the only one who likes old lady purses! The one you describe sounds perfect. Not being able to fit a book is a problem. This latest purchase is so small I can barely fit my phone and wallet in it. I still love it though.